Have you ever really looked at the ingredients list on a package of bread? We do. And of course we try hard to find brands with the least amount of ingredients and as much whole foods as possible. But it’s near impossible these days. As those store bought breads have to maintain a certain shelf life with equals at least a few ingredients that the average person has no way of knowing how to pronounce. A couple weeks ago while training my client, we got on the topic of breads and that she makes all of hers. Apparently she once read an ingredient list that had the word plastic in it. Say what? Plastic? Yep. If that’s not enough to make you think twice I don’t know what is. Well, hearing how much success she has (and I have a cousin who has baked her way through a few bread cookbooks that helped inspired me) I figured why not give it a try. 1. In a large bowl, stir together flour, salt and yeast. Add in warm water and stir using a wooden spoon until the mixture forms a shaggy but cohesive dough. Do not over-work the dough. 2. 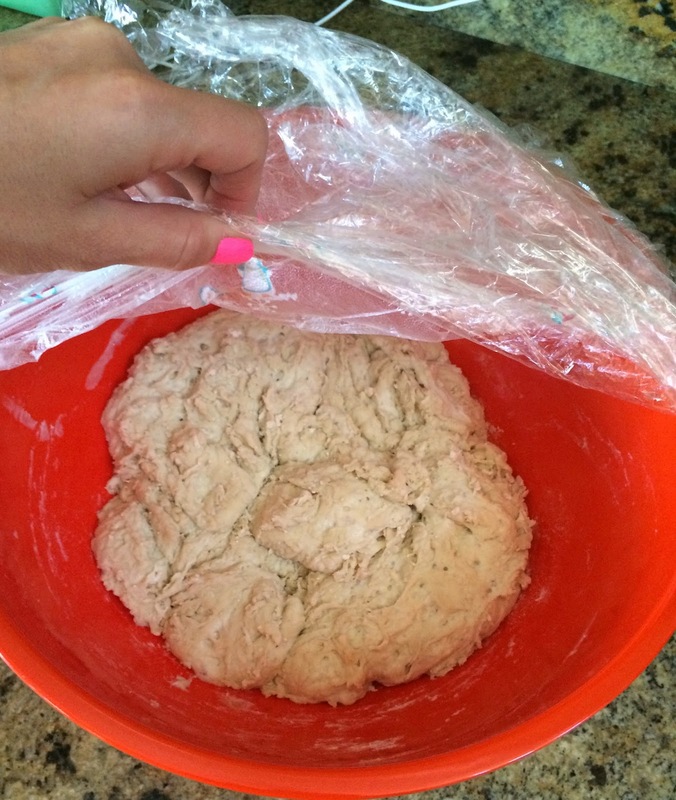 Cover the bowl tightly with plastic wrap and let dough sit at room temperature for 8-24 hours. (I just mixed it at night and then let the bowl sit overnight). Dough will bubble and rise. 4. 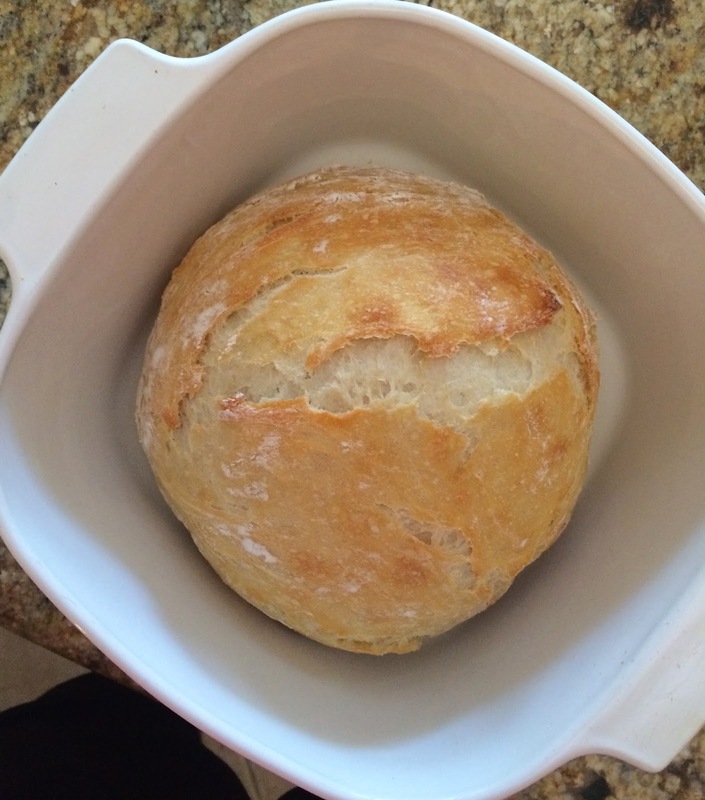 While Dutch oven preheats, turn dough onto a well-floured surface, & with floured hands, form dough into ball. 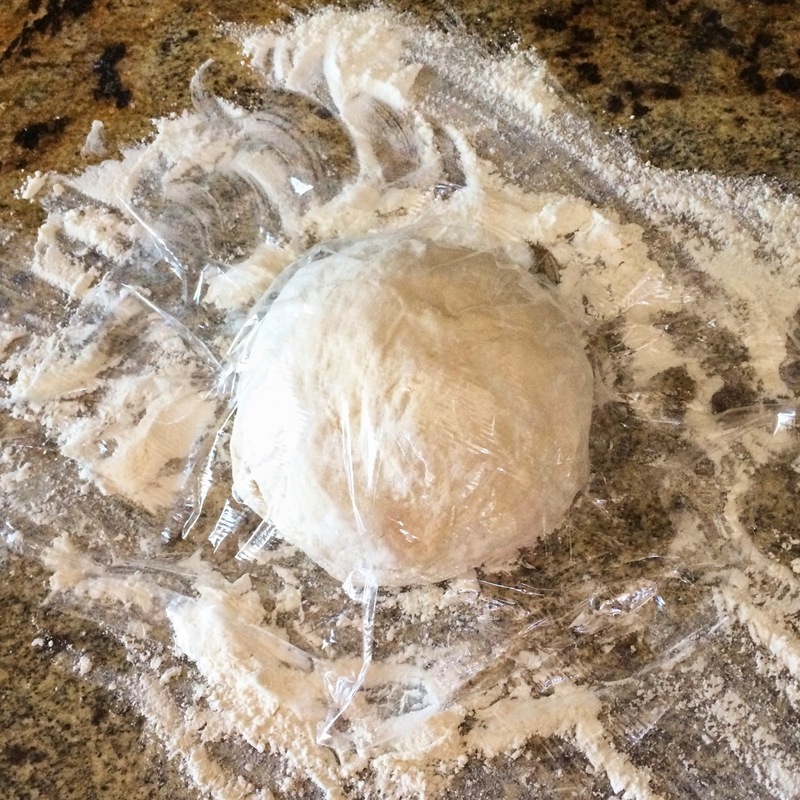 Cover dough loosely with plastic wrap and let rest. 5. Once the 30 minutes are up carefully remove Dutch oven. With floured hands, place dough ball into it. 6. Cover and bake in oven for 30 minutes. 8. 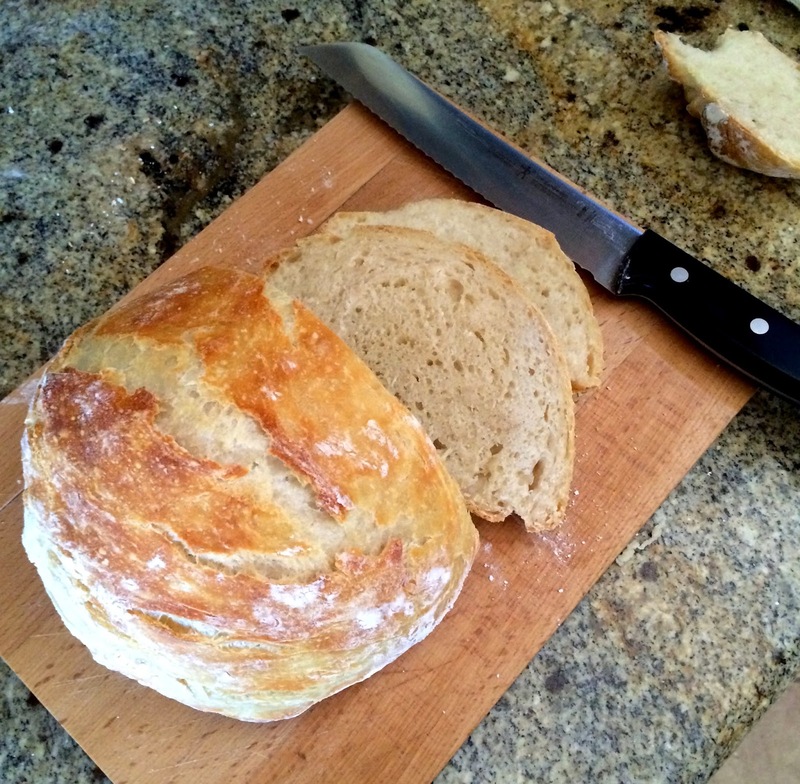 Remove bread from dish carefully, place on cutting board and slice with a bread knife. Hope yours turns out just as delicious! Happy Tuesday Friends… Lots to look forward to this week! I'm so excited to try this! 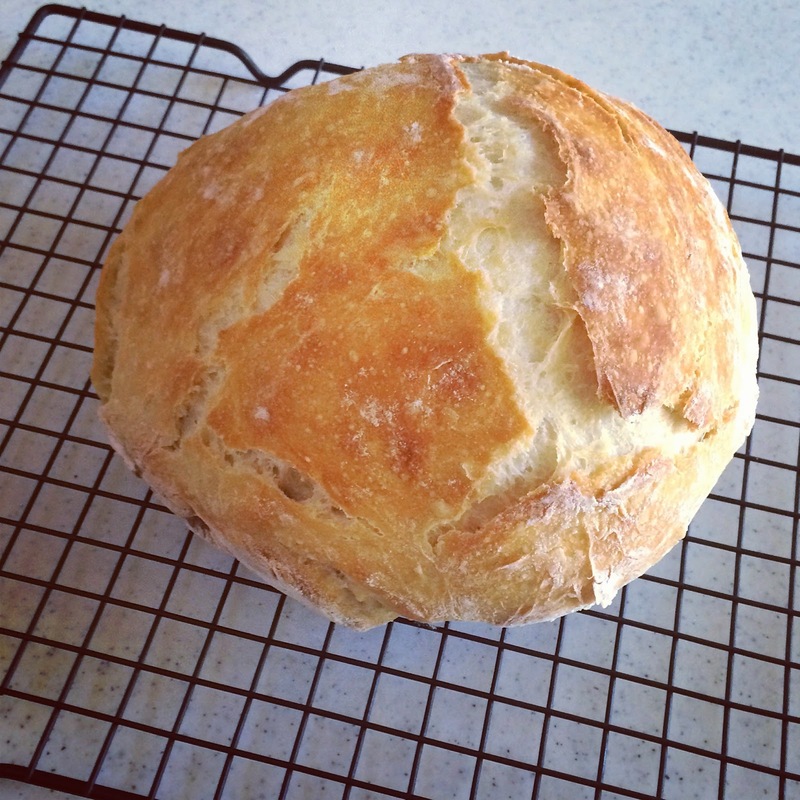 I've always wanted to make our bread but have been intimidated by the process.